Since he’s absolutely positive that he’s going to wind up rich and famous, twelve year old Greg Heffley (Zachary Gordon) has decided that sixth grade isn’t too early to begin building up material for both his memoirs as well as a historically accurate supply of answers to the many questions he’s sure will be asked of him by members of the press. Although his practical joking, dominant older brother Rodrick (Devon Bostwick) advises Greg not to do anything that will get him noticed in sixth grade since he predicts the younger Heffley will either wind up dead or homeschooled by their parents (Steve Zahn and Rachael Harris) before the end of the school year, Greg’s middle school modus operandi consists of doing the exact opposite. Informing the seventh grade hipster-in-training school newspaper reporter Angie (Chloe Moretz) who takes a liking to Greg and Rowley that he can’t join the paper since he’ll probably be in it a lot, Greg sets off to become the most popular kid to ever walk the floors of the suburban school. Sadly as a boy who freely confesses that he’s 95% smaller than most of his other growth spurt savvy classmates, Greg’s plans to achieve junior fame fizzle fast once his arch nemesis Patty Farrell (Laine MacNeil) lays the smack down on him after he tries to make a go out of wrestling. From Rowley mishaps to musical auditions, the self-centered Greg eventually realizes that making it through the year might be more important than becoming the king of the cliques, especially if he manages to steer clear of the dreaded “cheese touch” urban legend about the “nuclear cooties” to be found in an old slice of swiss cheese that’s become a sidewalk fixture. Based on young adult novelist Jeff Kinney’s extraordinarily popular book series that’s become the wizard and vampire free answer to the success of both the Harry Potter and Twilight series, director Thor Freudenthal’s energetic film is destined to appeal to its devoted, built-in audience of middle school students carrying around the titles in their backpacks. Regrettably, considering its overreliance on scatological gross-out gags that skewer to the most juvenile viewers as well as predictable, recycled plot points that shouldn’t be unfamiliar to anyone who’s read the superior books of Judy Blume, Beverly Cleary and/or Louis Sachar, the movie doesn’t have much of cross-generational appeal beyond those who’ve responded to the book. With the work’s largely absent parents, a completely unsympathetic older brother character and a main protagonist who frankly is nearly as selfishly unlikable, slightly cruel, jaded and at times just as unoriginal as Rodrick, throughout Diary of a Wimpy Kid I kept wondering just what the attraction was in the first place to the book series. While I can only hope that the novels are far more likable than the film’s portrayal of the events and similarly remain optimistic that the sequel slated for 2011 will improve upon this work’s shortcomings, repeatedly during the Blu-ray I couldn’t help imagining how much better and more charismatic it would’ve been had we been witnessing the exact same set-up through the eyes of the adorably clueless Rowley. 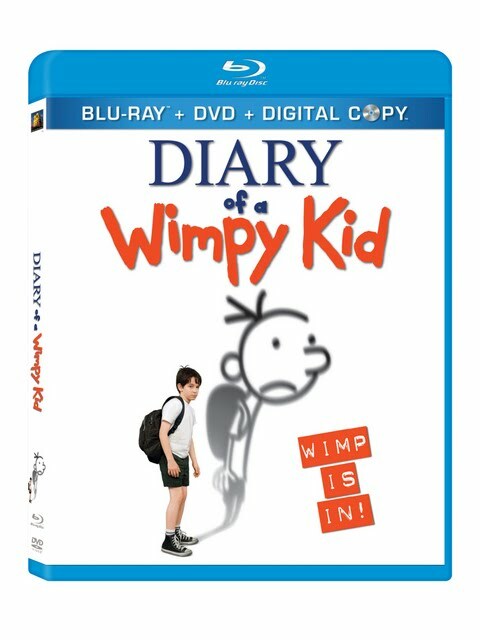 Fortunately, we do catch a glimpse of the world from the perspective of “an awesome friendly kid” with the delightful packaging of the Blu-ray plus DVD plus Digital Copy Combo Pack that incorporates some diary pages penned by the character of Rowley. And par for the course of the studio, Fox manages to deliver a first rate transfer of the recent movie to another technically impressive Blu-ray disc that’s presented realistically with lifelike flesh tones and an upbeat soundtrack. Promising “more gross, silly Fregley fun,” to coincide with one of the book and subsequent movie’s most repugnant characters along with other kid-friendly extras – much like Freudenthal’s film itself, this Fox set that delivers Wimpy in three different formats will be best appreciated by Greg’s ardent admirers who are eager to explore the boy who as it turns out didn’t have to wait that long to become internationally famous.